Throughout October, pumpkin carving is a fun tradition to do with children to get in the Halloween spirit. However, tools used for carving such as knives, candles, and small saws can cause serious injuries if not used properly. For young children, get creative with paint, markers or glitter to make a fun pumpkin without the risk of injury. If small children are around during carving, use pumpkin carving kits or knives that are specifically designed for carving. One of the most important safety tips accompanies the aspect trick-or-treaters spend the most time on, costumes. While most costumes are fun and creative, they often come with safety concerns because of length, color or accessories. Make sure costumes fit properly and are a good length to prevent tripping, especially in the dark. 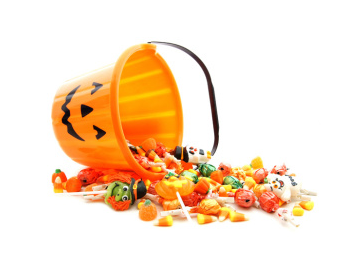 Most people assume that candy is the biggest harm on Halloween, but in Azalea’s experience, the most common harm on Halloween are breaks and fractures due to falling or injuries in the dark on Halloween night. Wear bright colors to make it easier for children to be seen and wear sturdy comfortable shoes. Always accompany small children during trick-or-treating or set check in times before it gets too dark and encourage the buddy system. Remind small children to stay on the sidewalks and carry a flashlight to avoid falls. Before diving into the candy collected, check to for spoiled or unwrapped treats. Happy Halloween from Azalea Orthopedics!